Keanu Reeves’ John Wick became one of the most unexpected successes of 2014. Made on a meager sum of $20 million, the movie grossed four times its budget and became a critical and commercial darling, inspiring a cult following. The sequel broadened the silent world-building, and doubled both its production budget and box-office gross, with the praises continuing for its gun-fu action sequences and dark, brooding setup. It appears John Wick: Chapter 3 – Parabellum could surpass both its predecessors if the first official poster and trailer for the movie are to be believed. Lionsgate dropped the first John Wick 3 trailer earlier today. We’ve seen hints and flashes of the insanity that awaits us through set photos that showed Keanu Reeves shooting thugs on horseback. The full trailer though makes a strong impression, not only for the amount of action sequences it packs in thanks to its almost-doubled $70 million production budget but also because of the promise of building up on John Wick: Chapter 2‘s excellent cliffhanger, by having Wick go full excommunicado and on his own, devoid of the services of The Continental or any of his fellow tribesmen. Here’s the trailer in its entirety. Even more impressive is the first poster for the movie which truly gives a sense of what lies ahead. 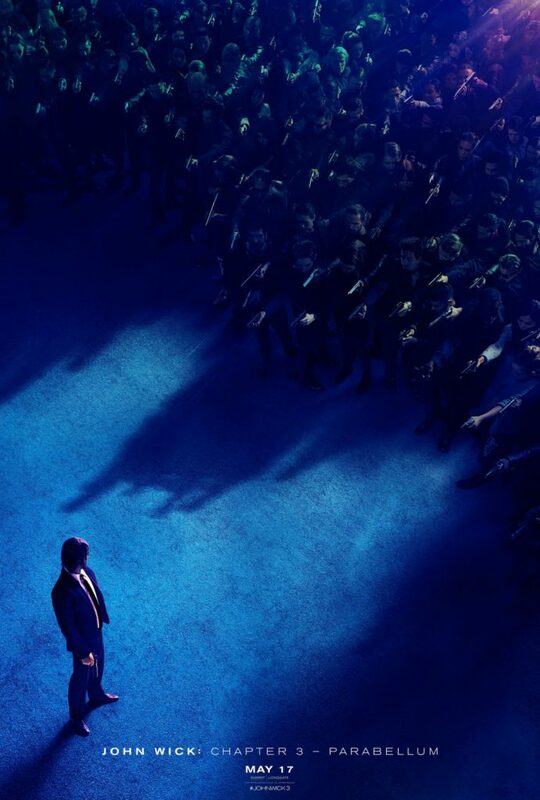 The poster sees Wick standing facing an army of assassins who’re eager to get a share of the $14 bounty placed on his head. The best part is that Wick is just standing there with nothing but a pencil in his hand, a nod to his infamous backstory in the movies where he killed guys in a bar “with a f*****g pencil”. A small little easter-egg if you will but it definitely makes an impact. Lionsgate seems fairly confident in the threequel, having given it a prime Summer 2019 release date. Directed by Chad Stahelski from a script by David Kloves, John Wick: Chapter 3 – Parabellum stars Keanu Reeves as the titular hitman John Wick alongside Halle Berry as Sofia, Lawrence Fishburne as The Bowery King, Marc Dacascos as Zero alongside a bevy of other names. The plot involves Wick on the run in New York City as he escapes a bounty placed on his head and looks to track the man responsible. John Wick: Chapter 3 – Parabellum releases in theaters on May 17, 2019. Without question, it will be rated R.